It’s been a thing on Instagram and Facebook… the ten year comparison: sharing pics of ourselves from ‘then’ and ‘now’. I think the intent is to consider how much we’ve changed: aged – for better or worse; or perhaps (on a less cynical note) to consider how our lives have changed. Or something. And then of course there’s the theory that we’re all helping Facebook (and whoever) improve their facial recognition software…. However I’ve only just realised that ten years ago (this month) was a momentous occasion for me. Cos it was then I started blogging! Ta Da! 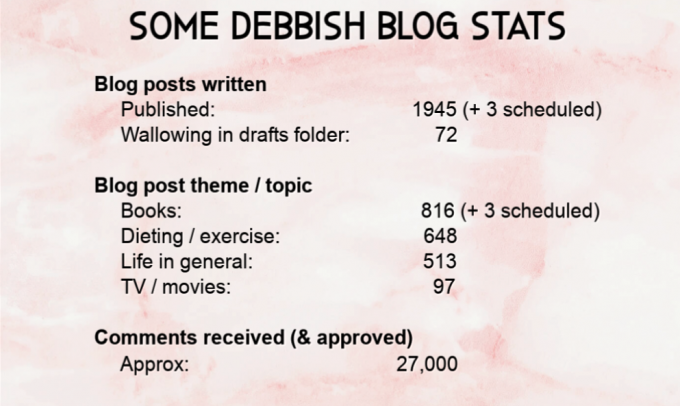 However, Debbish has gone through its fair share of iterations since its birth in January 2009 and I thought I should celebrate them rather than wallow in my lack of fame, fortune, success ‘n’ stuff! I actually started a blog called Write About Now on another blogging platform. I think it still exists but I’m not sure. Then everyone raved about the platform I use now (WordPress for those in the know) so I switched and copied ‘most’ of my posts over (not all as some were angsty things about my attempts to become a mother!). In 2012 I paid for both blogs to be self-hosted – which doesn’t mean much to non-blogging people, but just means I stepped them up a level and it allowed me to do paid or sponsored stuff on my blogs if I wished. I took the opportunity to rename Write About Now to Debbish (and change the associated social media handles / names over) and had banners designed for both sites so they looked more professional. I’m still using a version of the Debbish banner now though it probably needs a redesign. My foray into sponsored posts didn’t really eventuate as I contemplated whether I was prepared to sell my soul for 6 packets of crisps and the like. Don’t get me wrong, I was paid a decent amount for some posts but struggled with where to draw the line. In early 2014 I decided to merge my blogs. It would have made sense to have Diet Schmiet subsume the much smaller Debbish, but – though Diet Schmiet was very much the authentic ‘me’ – Debbish felt more like the person I wanted to be. I was tired of my life being about dieting and exercise and it was around the same time I completely dropped off all of the networking I’d been doing with other health and fitness bloggers. So Diet Schmiet just became a ‘category’ or theme in Debbish. It was also around this same time I started reviewing books – though I had written about some (as well as television and movies) earlier – as they’ve always been a passion. I realise I could have been ‘better’ recognised for my book reviewing had I separated them into two sites but – quite frankly – couldn’t be arsed. So here’s where I stand. Sadly I can’t offer up total visitor numbers because of the number of times I’ve killed off a blog and its followers, but still… there’s a lot of work that’s gone into those (almost) 1950 posts… not to mention the drafts! Of course, I should also mention I’ve been having the ‘Are blogs dead?’ conversations with a group of book reviewers. The jury is still out on that one but it does make me wonder if there’s more interest in short book reviews on Instagram than in blogs; or a preference for Facebook conversations about the meaning of life; or podcasts that don’t need a response at all but can be easily listened-to when the time suits. What would you like to see more or less of? From me and others online? And Anyways | Write of the Middle | Deep Fried Fruit. Oh wow, 10 years?! Congratulations. I’ll be celebrating 6 years in April. I don’t think blogging is dead, just evolving. True – it’s certainly changed since I first started! My twitter handle for ‘Write about Now’ was @rockafellaskank which made little sense to anyone. I couldn’t get WriteAboutNow and so named my account after the actual title of the Fatboy Slim song (Rockafella Skank)… though I THOUGHT it was called ‘Right About Now’. I still have my @schmiet twitter account but haven’t posted to it for a loooong time. Congratulations, Deb! Ten years of blogging is super. I enjoyed reading the recap of how your blogs have evolved. 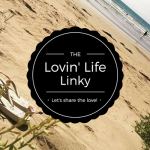 Keep on blogging and co-hosting Lovin’ Life linky. I was actually just thinking about my book blogging and not long after I started (in early 2014) I went to a national forum thingy and it occurred to me that some of the main book bloggers there no longer blog – those I knew in the early days. Congratulations Deb! I still love your banner – it’s one of the best examples of personal branding. I love how it’s morphed and grown and changed and…whatever…As for whether blogging is dead? I hope not. I do, however, think it’s evolving – as, indeed, it should. Yes, I just wonder if people have less time to read the twaddle I write / would prefer short snappy reviews on Instagram or a Facebook video or something. I worry I’m not moving with the times I guess – though I did start blogging because I loved writing so guess that’s why I’m still here. I’d say keep doing what you love until you don’t love it. I really like your stream of consciousness posts – and your reviews written in the same way. Ha yes, I still have my @Schmiet twitter account and my Diet Schmiet FB page I think. In fact, my damned Pinterest account is under the Schmiet handle as I couldn’t change it over when I rebadged! 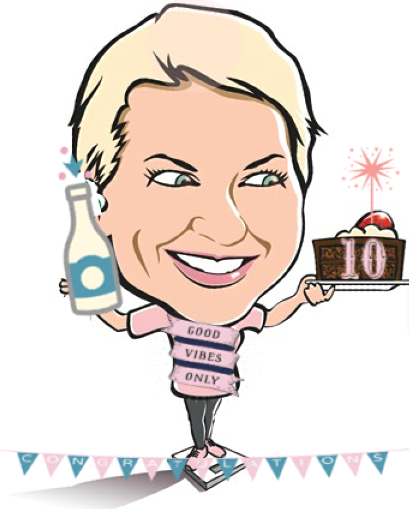 Happy 10th year, Deb! Thanks for sharing about your blog life history today. 2020 is my 10 year anniversary. Hoping I will still be at it by then. When you mentioned 2020 it seemed like forever away and then I realised it’s next year, so I’m sure you will still be blogging then! Well I love your blog posts. Congratulations. I admit I read the reviews as a skim as mostly that is about me. think my blog will be 9 at the end of this year but it has changed a gazillion time and I also had to pay for help each time. Self-hosted and via wordpress I have it well in hand myself and only contact the kind person who set me up the current way in 2013-14 if I have something I cannot solve. I did, however have THREE blogs for a while – thanks over-complicate your life Denyse – and none did as well as I had hoped. So, it is now me and that is it and only 1-3 posts a week. I deleted my old blogs only saving some education posts in draft and in doing the deletion at the host end saved money on having so much in storage. Keep on going because your writing I am sure helps you see how you are going too. Well-done! I actually saw you mention going to a Sydney blogging conference in 2011 (I think) the other day and remembered that I met you there then as well. You might not remember but we were actually at a Pie Face buying breakfast (next to hotel / venue) and I was struggling to find gluten-free options. I knew who you were and think we chatted for a bit (others were there as well). Congratulations on 10 years of blogging! I am in year 8 and I am not famous yet either……oh well, who cares! Ha, yes… fame schmame! Eight years, so you’re not too far off the decade as well! Thanks Patrick. I’m sure you’d agree (having been at it so long yourself) that consistency is key isn’t it? My advice to beginners is always to start in a sustainable way so they don’t burn out – which I think happens to a lot of people. Congratulations on 10 years of blogging. I enjoy your book reviews and love crime fiction, which you seem to review frequently which is great. I also love Instagram and podcasts, and would love to listen to your podcasts if that is something you pursue in the future. I find Instagram easier and quicker to navigate and can listen to podcasts while doing other things such as housework. Hi Carly and yes, I LOVE crime fiction, mysteries, thrillers etc… At the moment I mostly only use instagram to show what I’m reading (and other crap in my life). I like the idea of podcasts… I can’t imagine reviewing a book via one unless you were bouncing thoughts off someone else but don’t mind other podcasts of the navel-gazing / existential overthinking-of-life type! I remember your other blog Janet and yes…. I think some of it is luck / right post at the right time etc and others were probably smart in terms of their subject matter. I remember feeling like I’d missed a lot of opportunities because I wasn’t blogging about parenting. I’m not sure if that’s quite as problematic nowadays.